Angela Spady has written a wonderful book for young readers. Channing O’Banning and the Rainforest Rescue is clean and has a positive moral. I know that my 9-year-old will enjoy reading it and I am happy for him to do so. Fourth-grader Channing is one fast, run-on sentence. I love it. She is a little whirling dervish; quirky, zany, but a wee bit jealous. She has a bit of an issue with misplaced blame as most fourth graders tend to do. There are parts of this book that I found hilarious, such as connect the dots on your freckles and others endearing, such as Channing’s love of colored pencils and the fun names that she gives them. The story is filled with cute characters, my favorite of which is Teeny whom I believe i to be the best behaved pig on the planet. Tammie Lyon is a talented illustrator. The drawings are funky and fun; the pages are brightly colored and engaging. I looked at her website and she is, in my opinion, gifted with an incredible talent for illustration geared towards children. The moral of the story… Your child will learn that being a little know it all can often hurt you; you may miss out on the wonderful things that people who have different experiences and perspectives can show you. Channing also discovers that If you work together you might even be able to teach others something in return. "I guess I needed to stop and really think before making judgments about people—especially when I didn’t know the whole story." As you can likely discern from the title of the story Spady also encourages a green lifestyle. She advocates being thoughtful of your environment and taking small steps towards caring for it. There is a section at the end of the book which gives kids, and their parents, some practical ways to save the Rainforests. 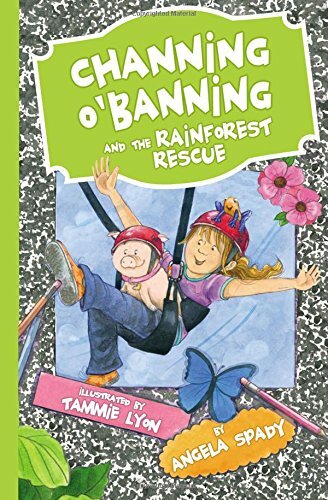 I have no reservations allowing my child to read and enjoy Channing O’Banning and the Rainforest Rescue. Author Angela Spady is an award-winning educator, curriculum author, and mother to two daughters in Kentucky and New Mexico. Her innovative teaching techniques have been featured on PBS, in KY Teacher Magazine, and in various print media around the country. She is a noted advocate for encouraging art and self-expression among children, and is often sought out by both parents and teachers on this critical topic. She lives in Taos, New Mexico with her husband Steve, and can often be seen writing, painting, or simply gazing upon the Sangre de Cristo mountains for a little inspiration. Interested in Southwest style, self-health or empty nesting? Check out Angie’s blogs at www.angiespady.com where she talks about all of this and more. My name is pronounced LION, like the animal not the swanky French way! I spend my days painting, drawing and writing books for children.